Clear OPP Bags with Recloseable Bottom Flap, 3" x 4"
Dimensions: 3" x 4" + 1"
Clear OPP Bags with Recloseable Bottom Flap, 3" x 5"
Dimensions: 3" x 5" + 1"
Dimensions: 4" x 6" + 2"
Clear OPP Bags with Recloseable Bottom Flap, 3" x 3"
Dimensions: 3" x 3" + 1"
Clear OPP Bags with Recloseable Bottom Flap, 6" x 9"
Dimensions: 6" x 9" + 2"
Clear OPP Bags with Recloseable Bottom Flap, 2" x 3"
Dimensions: 2" x 3" + 1"
Clear OPP Bags with Recloseable Bottom Flap, 2" x 2"
Dimensions: 2" x 2" + 1"
Clear OPP Bags with Recloseable Bottom Flap, 8" x 10"
Dimensions: 8" x 10" + 2"
American Retail Supply has clear jewelry bags made of polypropylene film with 1.2Mil thickness, this means it protects from moisture. One advantage over other bags and pouches for the clear jewelry bags is the high clarity, or see-through effect. 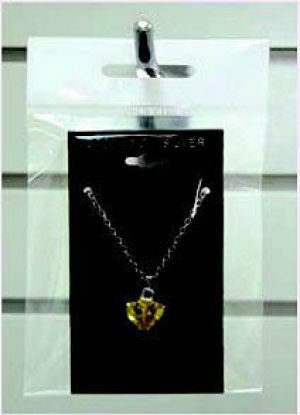 These clear jewelry bags are easy to reclose along the bottom flap and comes with top hanger hole. We have many clear jewelry bags sizes from 2 to 10 inches tall meaning any jewelry can fit. As the clear bag size increases, the gusset flap increases from 1 to 2 inches. American Retail supply has been supplying jewelry bags and pouches to business for years. Call 800-42605708 if you have any questions.